Following the disastrous events of 1st July the battalion were relieved in the front line trenches by the 8th Sherwod Foresters, who had acted as Brigade reserve for the attack, and spent the night in Fonquevilliers. The next day they marched to Warlincourt and were billeted in huts before moving into the Divisional reserve at Bailleulmont the following day. 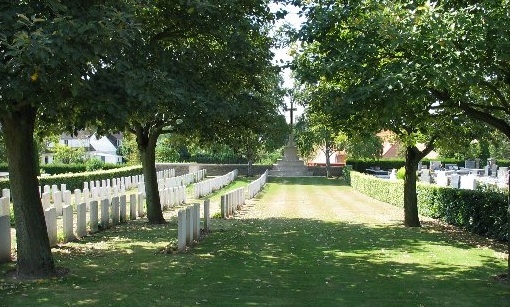 The 20th and 43rd Casualty Clearing Stations were based in Warlincourt from June 1916 and it was in the nearby cemetery that several Officers and men of the 6th Battalion were buried. The Battalion spent the next 10 days resting and refitting and it was during this time that several Officers and 62 other ranks arrived from base. 3rd July: Capt. W Seaton, 2Lts. WL Cooper & FS Rowland & 54 Other Ranks joined from base. 4th July: 8 Other Ranks joined from Base. Many of the men who joined the Battalion at this time were part of the 11th Reinforcement, which had arrived in France on the 12th June and had remained in the 46th North Midland Division Base Depot. On the 5th July many of the Battalion’s Officers who had arrived in 1915 with the 46th Division, travelled to the nearby Village of Saulty to bid farewell to Maj-Gen. Hon. 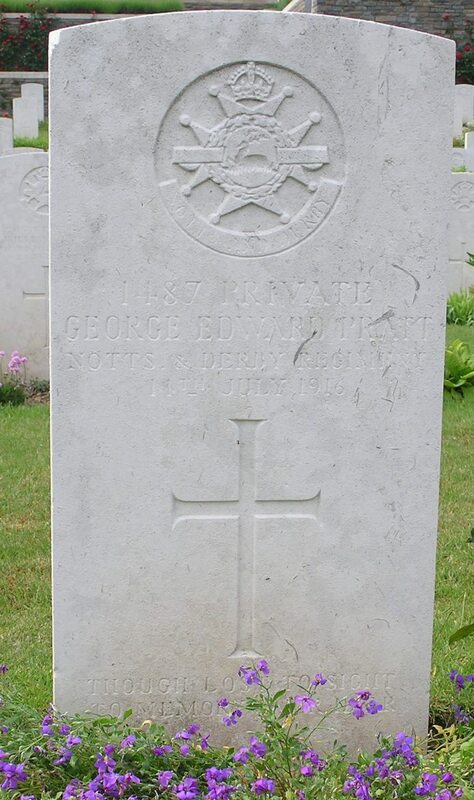 Edward “Eddie” James Montagu-Stuart-Wortley. Stuart-Wortley had been removed from Command for his apparent ‘soft-hearted’ approach to the attack and his reluctance to waste men in what amounted to nothing more than a side-show for the ‘big push’ happening further South. The 46th Division had suffered 2,455 casualties, which were the lowest casualty figures of all complete Divisions involved in the operations on the 1st July. The position of the North Midland Division at the bottom of the casualty list demonstrates how Stuart-Wortley had managed to save most of his division, but at the cost of his own command. Stuart-Wortley was posted to Ireland and was never again given an operational command; he was replaced by Maj-Gen. W. Thwaites on the 8th July. When also considering the 56th (London) Division’s casualties of 4,314, it becomes apparent that over 6,500 of the Nation’s best Territorial soldiers had been lost on the 1st July for a diversionary action which had probably cost the German’s 2000 casualties (including those lost in the seven-day artillery bombardment) and drew the artillery fire of three German Divisions. 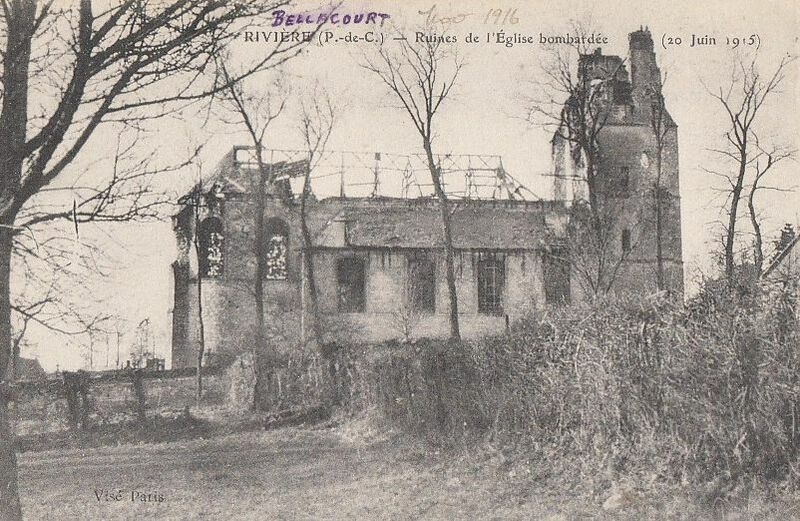 Battalion Headquarters was alternatively at Bellacourt Chateau or a farmhouse near to the Church in Grosville. Whilst in Reserve the men were billeted in the surrounding Villages. 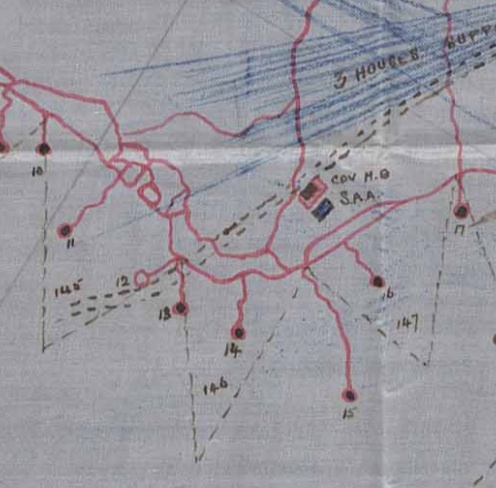 However, the war continued and between the 8th and 10th July the Battalion carried gas accessories to the front line trenches that were occupied by the 137th Brigade. Due to the high number of casualties suffered amongst the Officers, not only within the Battalion but also within the 139th Brigade as a whole, the War Diary records a number of temporary attachments, primarily to the hard-hit 7th Sherwood Foresters. And so it proved to be; on the evening of the 11th/12th July the Battalion marched to the front line trenches in front of Bellacourt and relieved the 5th South Lancashire Regiment in the right sector area, whilst the transport and quartermaster stores moved to Bailleulval. 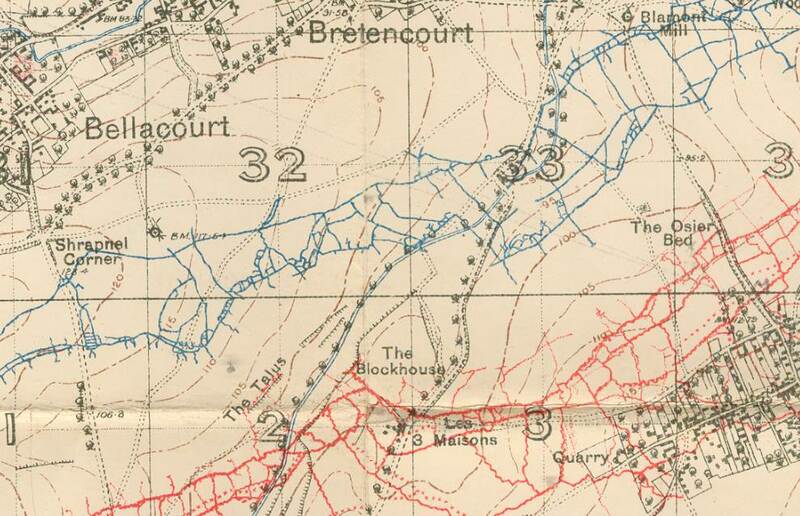 At this time the line taken over by 139th Bde was nearly 2½ miles in length and ran from south-east of Blamont to the Ransart-Bellacourt Road. The 139th Brigade formed the left flank of the 46th Division, which had the 11th (Northern) Division on its left (that included the 9th Battalion Sherwood Foresters). 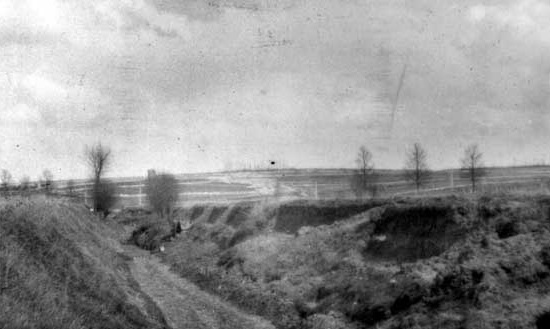 The 138th (Lincoln and Leicestershire) Brigade was on the extreme right of the 46th Division (opposite Hammercamp), whilst the 137th (Staffordshire) Brigade were placed in the centre near Monchy-au-Bois. This disposition resulted in an extended front which meant that the front line trenches were only held lightly as an outpost line with very little depth, whilst the communication trenches had slip blocks at the ends closet to the German front line. Overall this arrangement meant that constant trench patrolling was necessary for the trenches in this sector were approximately 300 yards apart, but there were a number of advanced listening posts on both sides. 1487 Pte. George Edward Pratt aged 26 and a Midland Railway servant from Brimington was the only man to be killed during this trench duty and was the first man of the 6th Sherwood Foresters to be buried in Bellacourt Military Cemetery, which was to act as the Cemetery for the whole time that battalion where in the front-line area. 12th July: 2Lt. E Jones and a draft of 8 Other Ranks arrived from base. On the Battalion frontage was believed to be a German strongpoint known as the “Talus” and during the evening of the 17th July the Talus was reconnoitred for the first time by a patrol led by 2/Lt Edward Kershaw. Following this patrol it was decided that the next time the Battalion held the front line a raid would be made on the German position. During the evening the Battalion were relieved by the 5th Sherwood Foresters and moved into Brigade reserve in the village of Bellacourt, with the exception of A Company, which remained in support of the 5th Sherwood Foresters. At this time the Battalion also supplied garrisons for Boundary Burnt Farm, Starfish and Orchard Posts. Whilst in Brigade Reserve the Battalion received a number of Officers recently arrived from England and the new Divisional Commander, Maj-Gen W Thwaites, made his presence known by inspecting the Battalion; he was reported to be pleased with the appearance of the men. 18th July: Capts. CVHC Blackwell, ES Wood; 2Lts. E Evans, VH Armitage, CL Croucher, WB Davies & AP Stoner joined the Battalion. 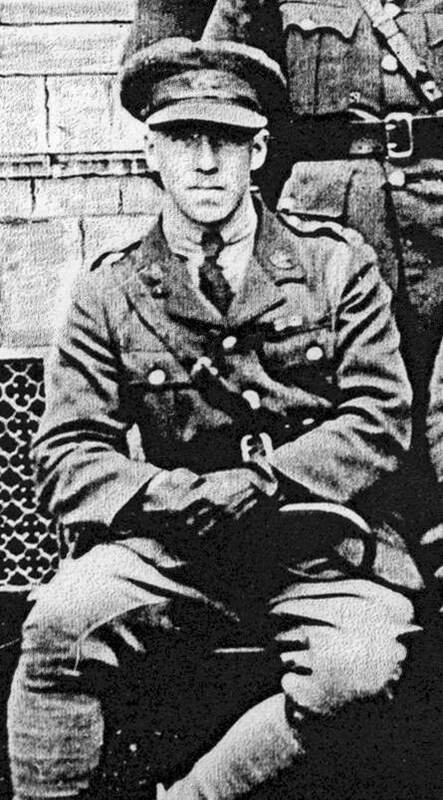 On the 20th July a very heavy bombardment of the front line trenches, occupied at that time by the 5th Battalion, required their reinforcement by Captain Victor Robinson and “A” Company. This was achieved within one minute of receiving the order and whilst no attack materialised, Lt Charles Cree and Privates Edward Churchill, John Crompton and Francis Melbourne were killed and 15 men wounded, several of these fatally. 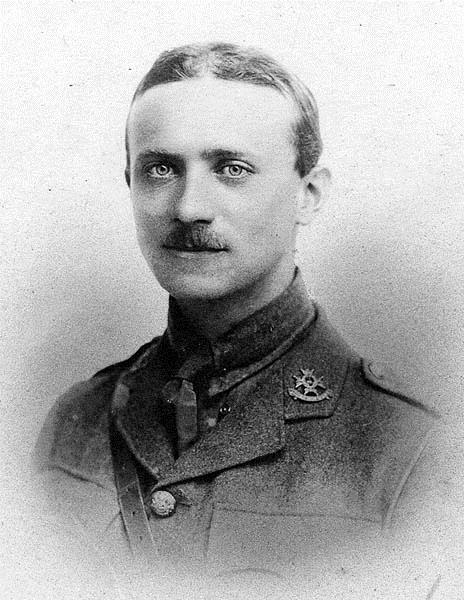 Lt. Edward Victor Cree, aged 29 and a law student from Beckenham in Kent. 4519 Pte. Edward Churchill, aged 24 and a miner from Grassmoor. 3768 Pte. John Henry Crompton a resident of Manchester. 3399 Pte. Francis Melbourne aged 20 and an apprentice brass founder from Ashbourne. 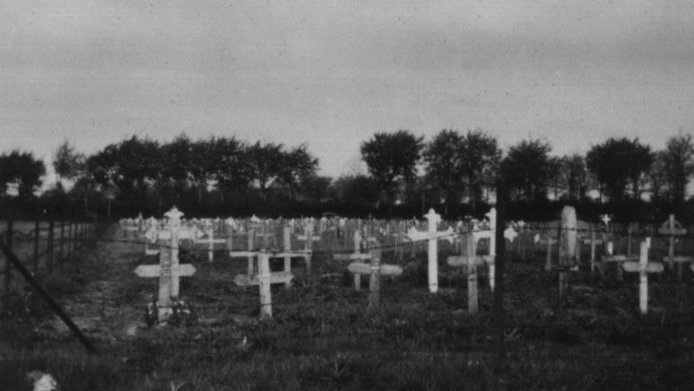 The men were buried next to each other in Bellacourt Military Cemetery. 4505 Pte. James Carney a pit linker originally from County Tyrone who died of pneumonia and GSW to the abdomen wall at the 20 Casualty Clearing Station and is buried at Walincourt Halte British Cemetery. 4105 Pte. Tom Vero aged 19 and a miner from Hasland who died of wounds in Number 2 Stationary Hospital and is buried at Abbeville. 3989 Pte. William Poyser a miner from Grassmoor who died of multiple shell wounds to the neck left forearm and leg at the 7th Canadian General Hospital and is buried in Treport. Both William Poyser and John Carney had arrived in France with the 6th Reinforcement in March 1916. 2802 Pte. Wilfred Buxton a bricklayer from Ashbourne. 3628 Pte. Samuel Charlesworth who returned to England and discharged. 3397 Pte. James Griffiths a colliery pony driver from Bolsover. 4108 Pte. 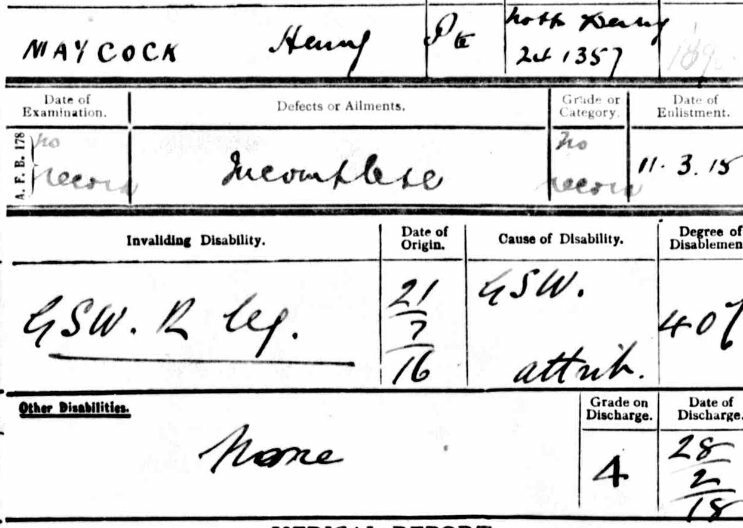 Henry Maycock, a labourer from Brampton who was severely wounded in the foot and transferred to England. 1714 Pte. John McTigh from Chesterfield who was transferred to England and discharged. 2309 Pte. Sam Nadin, a quarryman from Chapel-en-le-Frith, who suffered a GSW in left and right thigh and was transferred to England. 4470 Pte. George Platts, a core maker from Newbold, who suffered a GSW in the left side and was transferred to England. 2769 Pte. Albert Rivett a miner from Hasland. 4460 Pte. Joseph Williamson, a miner from Whitehaven, who suffered multiple shell wounds and was transferred to England and discharged. 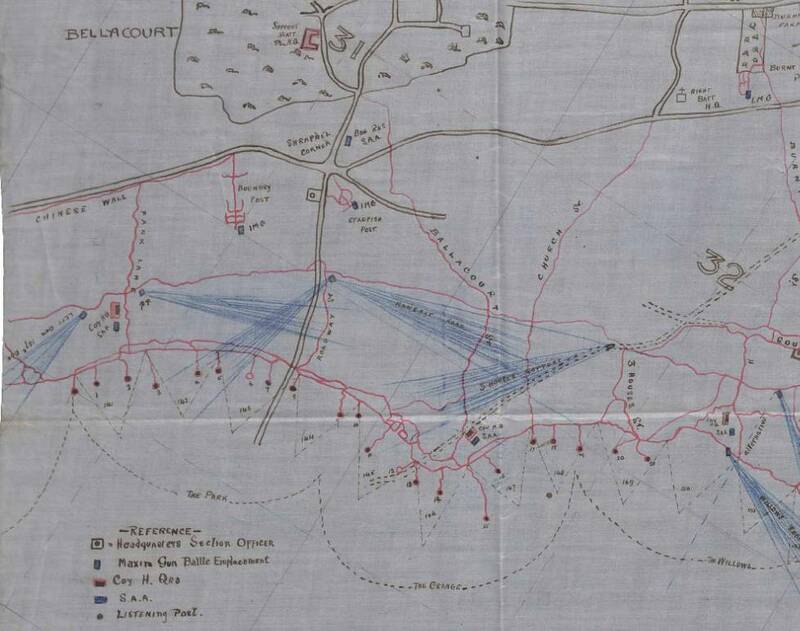 On Wednesday 23rd July the battalion moved into the front line trenches for their second trench tour of this sector and plans were put in place for a raid in strength on the talus. The Battalion were relieved by the 5th Sherwood Foresters and moved into Billets in BAILLEUVAL. 4589 Pte. 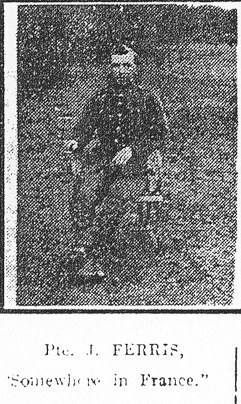 George Slater aged 29 and a labourer from Chesterfield who died at the 20th CCS of multiple GSW to the skull, legs chest and arms. 1809 Pte. Leon Barton a quarryman from Dove Holes who suffered a GS wound in the left knee and was admitted to the 3 NMFA, 20 CCS and 16 General Hospital before being transferred to England. 1661 Pte. James Ferris aged 22 and a rope runner from Peak Dale who suffered a shell wound that cause a fractured right femur. He was admitted to the 3rd NMFA and 20 CCS before being transferred to the 2nd Canadian General Hospital. He died of shock on the 9th August following amputation and is buried in Le Treport. 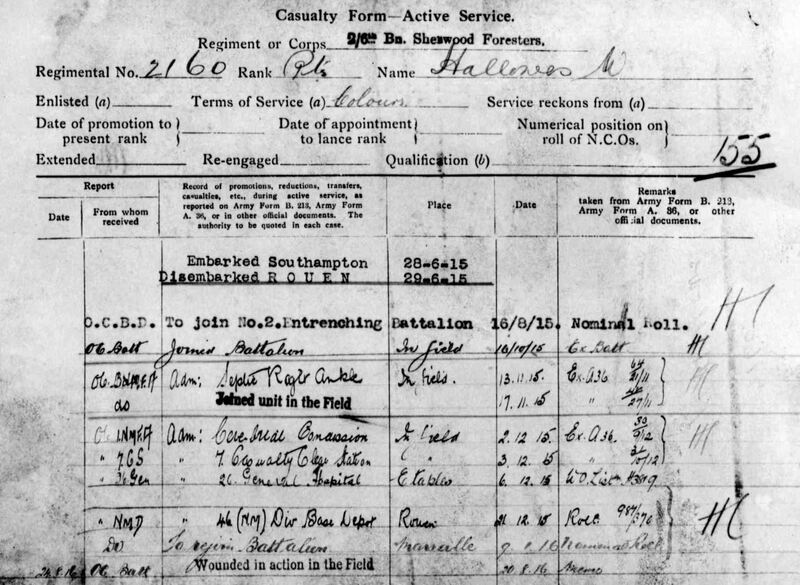 During August the Battalion were placed either in Brigade reserve at Bellacourt or Divisional reserve at Bailleulval and Battalion headquarters was either in Bellacourt Chateau or in a farmhouse close to the old church in Grosville. At this time all of the transport sections of the Brigade were billeted at Bailleulval and remained there until September. 2nd Lieutenants Alfred Leopold Dent and Alfred Francis Briggs joined the Battalion at the beginning of the month, followed by a draft of 11 Signallers and 15 Lewis Gunners at the end of the month. During their time in reserve the battalion undertook inter-company competitions in bayonet fighting and gas helmet drill. “A” Company won the bayonet competition and the battalion bombers picked up the trophy for gas helmet drill. It is also recorded in the 5th Sherwood Foresters Battalion History that Football and Cricket matches were played between Battalions of the Brigade. The Battalion relieved the 5th Sherwood Foresters in the RIGHT SECTOR. 3007 Pte. 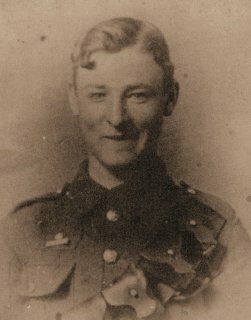 Charles McCreery aged 18 and from Wirskworth who died of wounds at the 20 CCS on 6th August and is buried in Warlincourt. 2466 Cpl. Gershon Shimwell a joiner from Youlgrave. 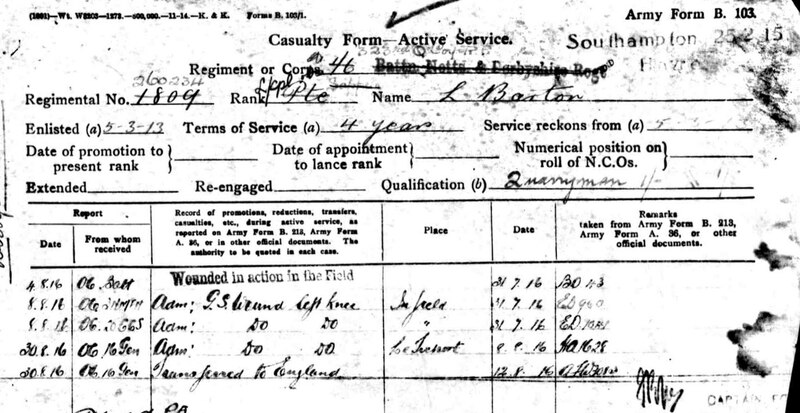 3588 Pte Walter Grafton a limestone quarryman from Bonsall. 2924 Pte. John Taylor a weaver from Wirksworth. The Battalion were relieved by the 5th Sherwood Foresters and moved into Brigade Reserve at Bellacourt. On the 19th August at about 12.15 am the Battalion came under attack from German shells. 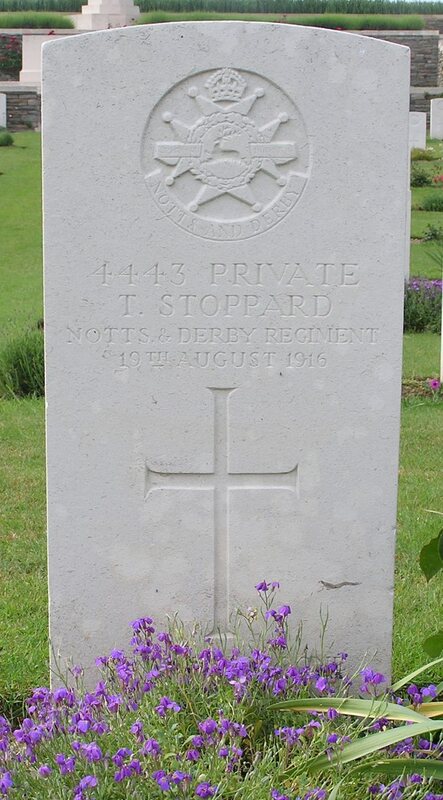 Thomas Stoppard of Clay Cross, who was attached to the 139th Trench Mortar Battery, was killed and 17 other men were wounded. 4443 Pte. Tom Stoppard aged 34 and a miner from Clay Cross. 3683 Pte. John Arthur Andrews aged 30 and a plate layer from New Whittington. 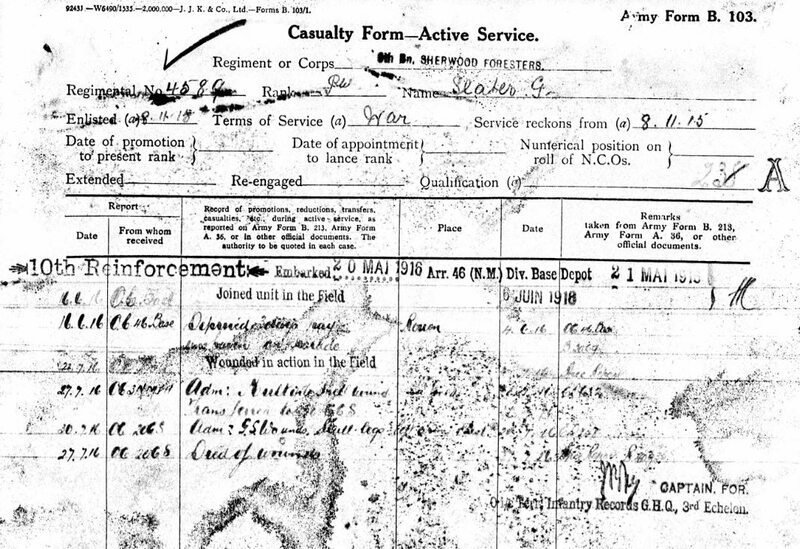 John was the 95th man from New Whittington to be killed. He was the son of Mary Ann Andrews of 142 South St., New Whittington, Chesterfield. and before enlisting he was employed in the pipe shops at Staveley Works. He was 31 years of age and had been in France for about ten months. 2160 Pte. William Hallows aged 19 and a general labourer from Wirksworth. John Andrews and William Hallows were buried close to each other in Warlincourt Halte British Cemetery by men of the 20th CCS. 4631 Pte. Francis James Eyre a grocers assistant from Eyam. 3239 Pte. Arthur Goodwin a farm labourer from Wirksworth. 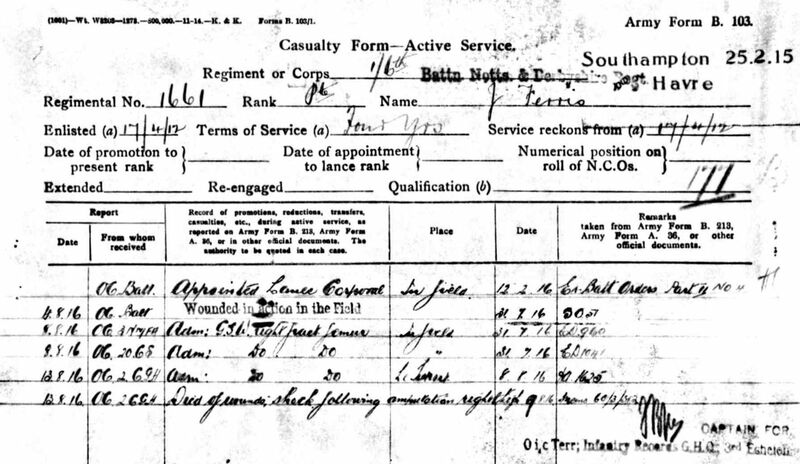 3099 Pte Nelson Hewitt a moulder from Matlock who suffered a GSW in the arm and was transferred to England and discharged. 1310 Pte. William Hudson a clockmaker from Ashbourne. 4417 Pte. George W Knowles. 3046 Pte. Harold Phillips and transfered to England. Relieved by the 5th Battalion and moved into Divisional Reserve at BAILLEUVAL. A draft of 11 Signallers and 15 Lewis Gunners arrived from the NM Base Depot. Although Bellacourt was a relatively safe and undamaged village due to its location on the reverse slope of a crest, it was noted in the Battalion history that at night machine gun bullets did occasionally ‘whizz’ down the street and the Germans experimented with time delayed fuses on a number of large calibre shells, one of which completely destroyed a house next to the Chateau, which of course housed the Battalion HQ. Altogether the battalion undertook three 6-day tours of duty in the trenches in front of Bellacourt during the month of August. These were between 4th – 10th; 16th – 22nd and 28th – 3rd September. September and October was a relatively quite time for the Battalion and it must have seemed to the men that the Battles of the Somme and Ancre were a million miles away. Following a further raid on the Talus on the 1st September, which was halted by barbed wire, the Battalion were relieved by the 5th Sherwood Foresters and moved into brigade reserve at Bellacourt but continued to provide garrisons for the various strong points. Throughout the next two months the Battalion alternated between right sector front line trenches in front of Bellacourt, Brigade reserve in Bellacourt or Divisional Reserve in Bailleulval. This arrangement effectively meant that each Battalion of the Brigade spent eighteen days in the village of Bellacourt, comprising six days in the front line trenches, six days in reserve, and another six days in the trenches followed by six days rest in Divisional Reserve in Bailleulval. Battalion relieved 5th Sherwood Foresters in RIGHT SECTOR. 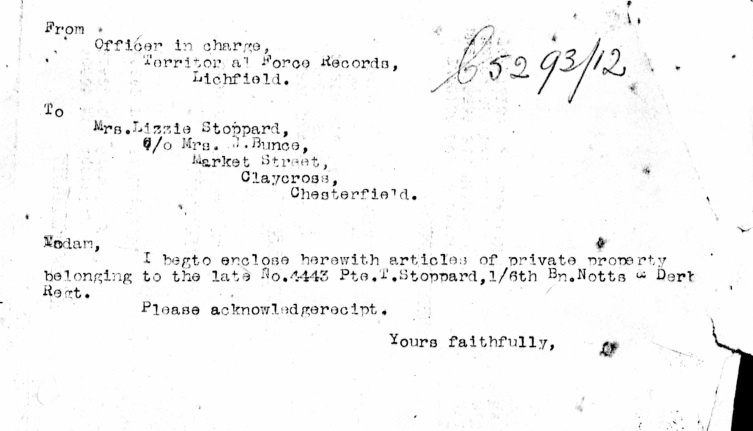 Battalion relieved by 5th Sherwood Foresters and moved into Divisional Reserve and occupying billets in BAILLEUVAL. 3905 Pte. John Lovatt a miner from Brampton received a fatal kick in the abdomen from a horse. John died in the 20 CCS and is buried in Warlincourt Halte British Cemetery at Saulty. 22 men on the 16th September. Lt Gilderoy Glossop and 10 men on the 27th September. 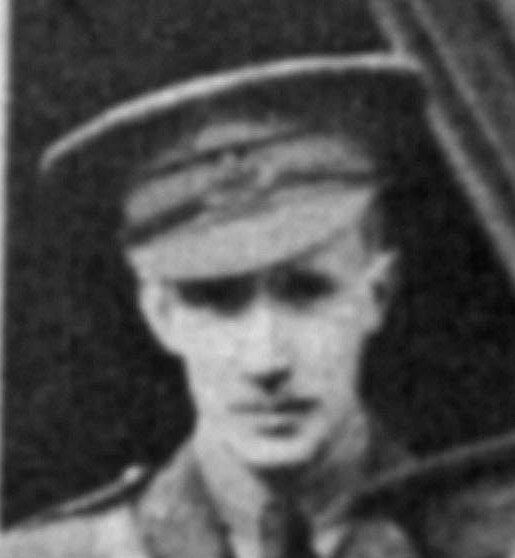 During this time 2/Lt William Bryan Davies died in Hospital on 17th September; he had only joined the Battalion two months earlier on the 18th August. Although there is no mention in the War Diary or Battalion History as to why he was in Hospital, the Battalion Officer’s Role sadly states “suicide”. William was 35 years old and the son of Thomas and Mary Davies of Welshpool in Montgomeryshire. He is now buried in AVESNES-LE-COMTE COMMUNAL CEMETERY EXTENSION, which was the VI Corps Headquarters and the site of several Casualty Clearing Stations. There is no medal index card for William, suggesting that his medals were not claimed by his grieving parents. It is possible that William was Idwal Davies' older brother. 4511 Pte. Robert Spencer aged 18 and an ironmonger from Ashbourne died of his wounds at the 43 Casualty Clearing Station and is buried in Warlincourt Halte British Cemetery at Saulty. 3437 Pte. 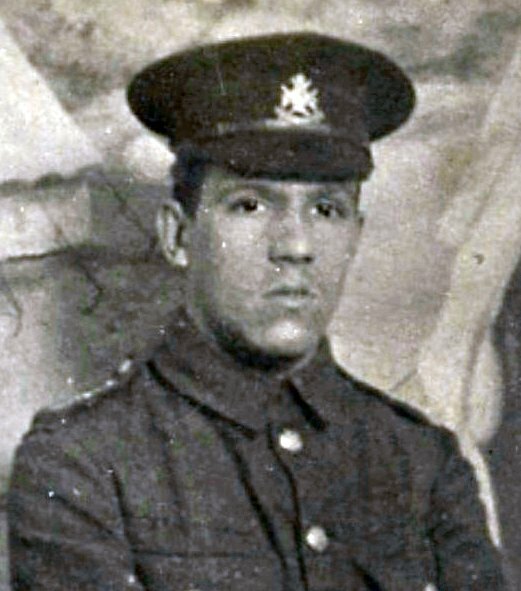 Albert Baguley aged 22 and a miner from Staveley who received shell wounds in the chest and arms and died the following day in the 43 Field Ambulance. 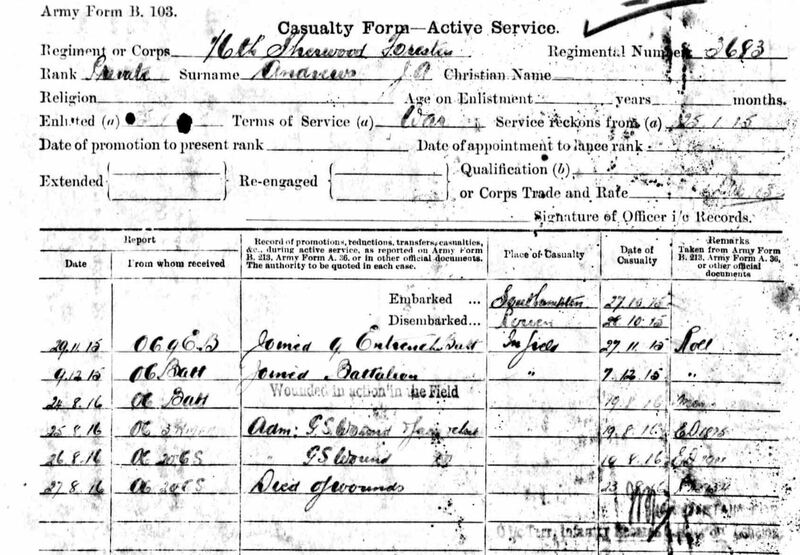 He had been wounded or sick on 3 previous instances in 1915; April (N.H.D ? ), August (shell wound and scabies) and November (tonsillitis). Battalion relieved by 5th Sherwood Foresters and moved to BELLACOURT. On the 27th of September all the ‘long rifles’ were withdrawn and replaced with ‘short rifles’ (SMLEs). 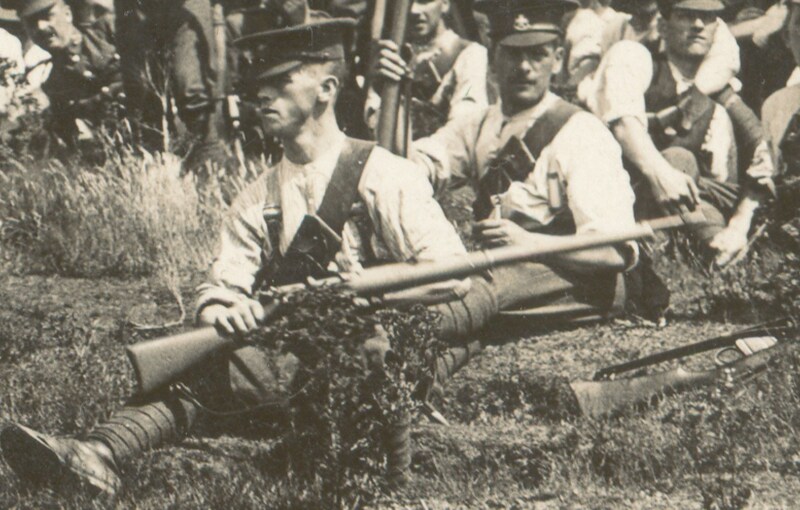 Whilst undergoing training in Harpenden the Battalion had been equipped with re-sighted charger loading rifles. This was a Lee-Enfield conversion that had been adopted by the British Army in 1907 and replaced the ageing ‘Lee-Enfield’ Magazine Rifle Mk 1, which had been developed in 1897. The charger-loading rifle also had new front and rear sights fitted, which were adjustable for windage. The No 1 Short Magazine Lee-Enfield Mk Ill* Rifle was adopted during World War 1 and was adapted from an original design by James Paris Lee and the Royal Arms Factory at Enfield. Second Lieutenant Kenneth Hill Bond, M.C. On Sunday 1st October the Battalion relieved the 5th Sherwood Forester and returned to the front line trenches in the right sector. During this trench tour the Germans attempted a raid on number 14 Sap, but were driven off leaving two wounded prisoners. After seven days in the trenches the Battalion were relieved by the 5th Sherwood Foresters and moved into Divisional Reserve in Bailleulval. 5119 Pte. Frederick Arthur Parrott aged 26 and a groom gardener from Hatfield. 3003 Pte. Frank Guy Harvey, a domestic servant from Wirksworth, who received a GSW in the right shoulder and was transferred to England and later discharged. 3850 Pte.John William Duce from Brampton who was later killed in action on the 1st July 1917. 2569 Pte. William Howard who was later discharged from the Gloucestershire Regiment in March 1919. 3931 Pte. James Wheat from Chesterfield. During the rest of the month the Battalion were either in the trenches (13th – 19th October) or Brigade reserve in Bellacourt (19th – 25th October). After their final trench tour of this sector the Battalion were relieved by the 2nd Battalion Royal Scots Fusiliers (90th Brigade) and marched to billets in Sus St Leger. The only fatal casualties recorded for the month of September were John Lovett from Brampton, Robert Spencer from Chesterfield and Albert Baguley of Staveley. 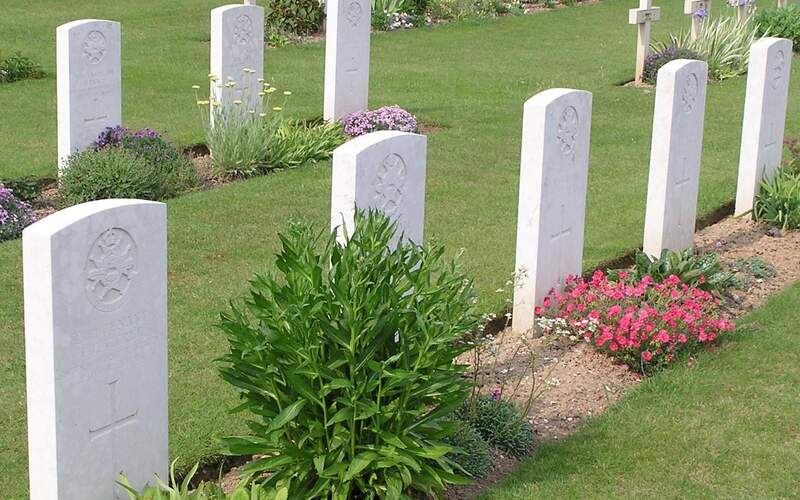 Robert Spencer and Albert Baguley both died of wounds and all three men are buried in Warlincourt Halte British Cemetery in Saulty, but the War diary does not record any of these casualties. 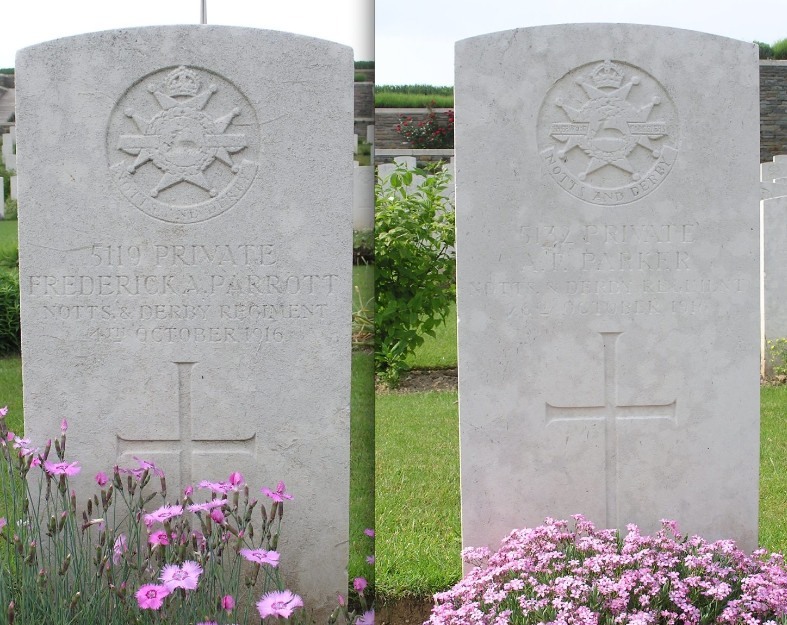 In October only 2 men were killed; Privates 5119 Frederick Arthur Parrott and 5132 Albert Francis Parker, both men enlisted in Bury-St-Edmonds and were residents of Herfordshire. 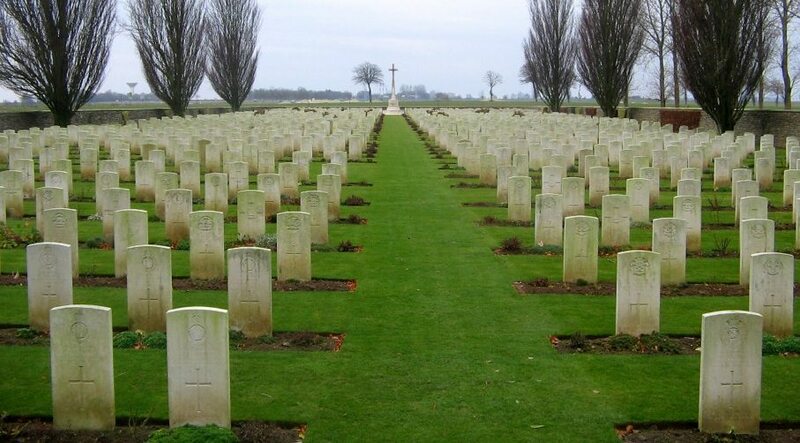 They are buried close to each other in Bellacourt Military Cemetery. During the month of November the Battalion were in billets close to Gadennes, which was near to Abbeville and North-East of Amiens. At this time a number of Officers were transferred to the 11th Battalion Kings Royal Rifle Corps and struck off the Battalion strength. 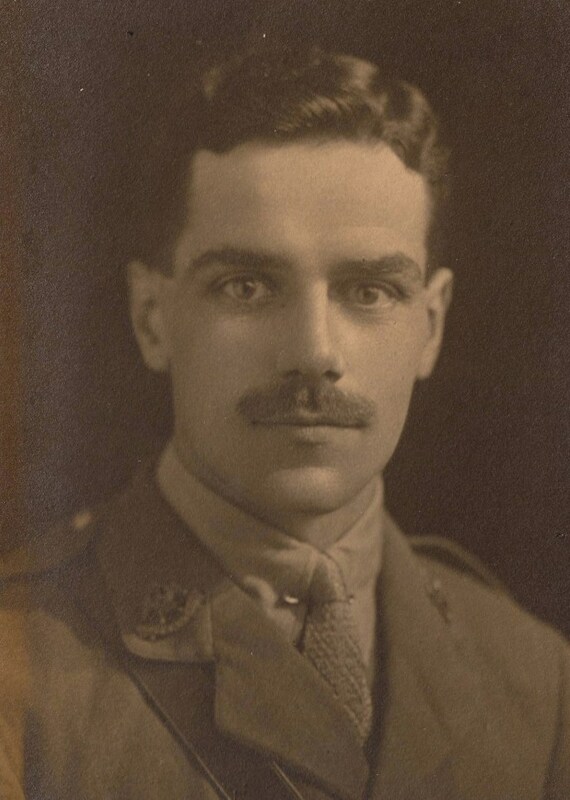 Lt Col Goodman received orders to precede to the command of the 52nd Infantry Brigade, with the temporary rank of Brigadier General, whilst Major Hall took over command of the 6th Sherwood Foresters. At this time 100 William Duncan Jamieson was promoted Quatermaster and Honorary Lieutenant. During this time the Battalion underwent training in the St Riquier training area. I have a Photogragh of tom Vero not a good one but I could email you this. Unfortunatley my Great Uncle Arthur Stocks Private 3513 1/8th Sherwood Forresters, killed aged 21 years, 21/916 and buried at Bellacourt is not mentioned. I would like to rectify this. I am a recently retired Nottinghamshire firefighter and ex RN Falklands veteran living in Rivière (what was bellacourt/grosville etc.) I have a great interest in both wars in which this area played an important role. If anyone would like info or pictures of area or a contact for future visit please feel free to get in touch.